Combine all streusel ingredients in the bowl of a food processor and pulse until mixture is crumbly and size of small peas. Set aside. Using a mixer, combine butter and sugar until light and fluffy. Add eggs one at a time, mixing well after each addition. Add Kerrygold Irish Cream Liqueur and sour cream and mix well. In a small bowl combine flour, baking powder, baking soda and salt and stir to combine. Place ½ of the batter in the loaf pan and top with half of the streusel mixture. Spread remaining batter on top of streusel. Top the batter with the remaining streusel and bake for 50 minutes or until toothpick comes out clean. Remove from oven and cool completely in pan. 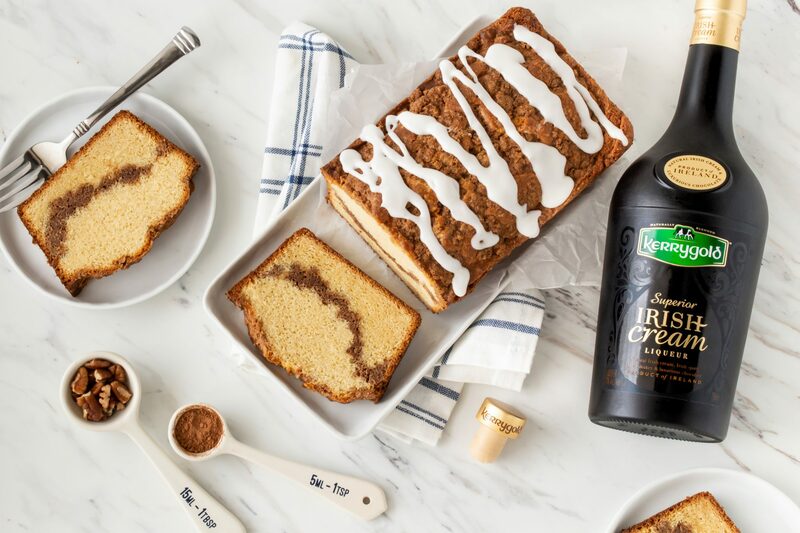 Whisk powdered sugar and milk together in a small bowl until smooth and drizzle over baked coffee cake.